You should not expose it to the sun immediately after needling and you should use a sunscreen until it heals. I really think a dermastamp is more suitable in the ankle area but if you choose to do single needling as well, do it in turns: Use the dermastamp and next time use the single needle. If you needle/stamp relatively shallowly and it heals nicely and quickly, you can stamp or needle every two weeks. Yes you can buy it in a grocery shop. Apply it at least for 3 days. If the skin seems to be still a bit dry, tender, red or not completely back to normal, apply it longer. The red marks will quickly disappear. No, you should not push it all the way in. Go to the depth of pinpoint bleeding. The depth of pinpoint bleeding is not the same for everybody. Vit. C for three consecutive days applies prior to rolling once in three weeks with a 1.5 mm roller. In other cases, applying vit. C every other day or even less is sufficient. For Tretinoin, it is sufficient as well. You can apply benzoyl peroxide twice a day but do not apply immediately after dermarolling. On the body, you can use for example almond oil (apply it when the skin is still wet). On the face as well in principle, but not if you are prone to acne. If you are acne-prone, use a product that moisturizes but does not break you out in your experience. This is not the same for everyone. On the face: wet a cotton pad with tap water, add some almond oil and apply it to your face. Keep the large container of almond oil in the fridge and refill a small one that you can keep in the bathroom. Oils are wonderful moisturizers because they form films to prevent water evaporation from the skin. - Day 1: Roll the whole area with the regular 1.5 mm roller. - Next 4 weeks: Roll each individual stretch mark very densely and thoroughly with the one liner roller (or use the single needle). Roll every time a different stretch mark. Each stretch mark is rolled once during that time but very thoroughly. Give your skin a week off. Do nothing, just moisturize. - Next 4 weeks: Roll each individual stretch mark very densely and thoroughly with the one liner roller. Roll every time a different stretch mark. Each stretch mark is rolled once during that time but very thoroughly. The redness and irritation is only temporary and it is fully reversible. Tretinoin is not an ordinary skin cream; you have to regard it almost as an acid peel. A pea-sized bead of cream is enough for the whole face. The more is not the better. Too much will only irritate the skin. Use a moisturizer. You can even mix it with a moisturizer. There is no need to apply it every day. Two or three times a week is enough. The skin has to get used to it. The reaction of the skin is less severe with prolonged use. If your skin is rather sensitive, do not buy a stronger percentage than 0.025%. When you're just starting out with Tretinoin, it is very advisable to buy our 0.025%. We offer a small 18 g jar for that "breaking period" purpose, at an affordable price. Do not use Tretinoin when pregnant, planning a pregnancy or while breastfeeding. If you do not want to use the single needle, buy a 1.5 mm dermastamp and use it on all scars on your face and leg. All scars that you had mentioned. >yep , but what does that mean ? You just buy one ? That is not realistic to achieve. Knees have wrinkles because there is extra skin so that the knee can bend (the same with the elbows). You may be able to improve the skin texture but not completely remove the wrinkling. Prior to dermarolling: Buy a pumice stone. Give your knees very good scrub twice or three times a week for at least two weeks. Let it heal and keep it moisturized. The skin on the knees is very thick - you have to buy a 1.5 mm dermaroller. Roll the knees every three weeks. One week prior to each rolling, use the pumice stone. Use the pumice stone + the 1.5 mm roller on your arms as well. If you use the same roller on all the areas you described, it will blunt rapidly. Your areas are extensive, you will need more rollers. Or by just one, try it and later decide if you want another one. Dermarolling can improve mild skin laxity but if there is already lots of excessive skin, you need a facelift. The cheeks deflate with age due to fat recession and sometimes also due to bone recession. Dermarolling cannot fix it. 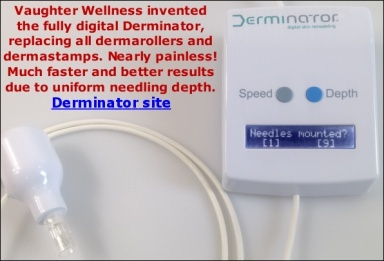 Dermarolling can only affect the skin and thicken the skin by about 0.5 mm. That is enough to greatly improve scars, wrinkles and skin texture but it is not enough for "plumping" the volume. Just under the eyebrows, yes. You can use your 1.5 mm dermastamp in this area. The area above the lip is very sensitive. I can roll anywhere on my face and body with a 1.5 mm or 2 mm dermaroller without a numbing cream with the exception of above and around the lips. I use a numbing cream there. the region with scissors and sits straight in between eyebrows like a line. induction and will keep picture history for you). all the tasks I mentioned? Thanx so much Sarah , Ive joined the forum so u can post this up if u want. Please advise asap as I CANT WAIT !!! That's normal, since you're putting quite a high percentage of vit. C on your skin so you'll end up with a chalky, sticky layer. That's however the only good way to get a high concentration of vit. C into the skin, so you'll have to endure it for a while, until it has been absorbed. You can also just use a lower concentration. Leave it on as long as you can handle it (at least half an hour or so). You can use lukewarm water to dissolve the vit. C, or even hot water, because it's mainly enzymes, not high temperature, that degrade vit. C in the short-term. But all skin-lightening creams have issues one way or the other. I removed the word "completely" from my previous reply because it just has to be more or less healed - it means the skin is not swollen, red and tender. Plan the rolling session of your face, neck and other sun-exposed areas with long needles such that you don't have to go outside immediately after rolling. If you have to go outside, apply a sunscreen but the best is to stay inside until at least the next morning. If you roll your body, you can go outside immediately afterwards, just cover it with clothes. Pharmacies probably carry salicylic acid products. Ask for a salicylic acid product that contains about 5% or a little more. Alcohol will quickly evaporate from the skin. You can use rubbing alcohol containing isopropyl to disinfect the skin but ethanol is perhaps a little gentler to the skin. Wow, I'm really surprised how wonderfully needling worked for this condition! Your sebaceous hyperplasia is gone! Thank you very much for your feedback. Let us know in the future whether you were a successful "Terminator" or whether the glands reappeared. Worst case, you just needle them every time they reappear.